No wonder Netflix recommends this! The Sony KD-55X9300D 4K HDR TV is the first HDR TV that we've tested and it sets a pretty high standard for such televisions. If you can afford it, you won't be disappointed with this TV, and we do recommend it to those looking for good colours, sharp picture quality and a good, smart operating system. Of all the TV technology that we’ve seen in recent years, HDR may be the first to really make mainstream, commercial sense. Why? Because you can actually see HDR. Unlike 4K and 3D, the impact of HDR is easily visible to the human eye, and it makes a pretty big difference. HDR stands for High Dynamic Range, and essentially provides the darkest blacks and brightest whites, improving the overall contrast ratio of the TV and providing natural, lifelike colours. You will, however, need HDR-ready content, which is sparse in India right now, and content can’t be upscaled to HDR as it can with 4K. Sony’s 55X9300D 4K HDR TV is the first of its kind that we’ve encountered, and it has a lot going for it. While the picture quality isn’t as good as OLED TVs, it’s without a doubt amongst the best today. The Sony 55X9300D sports the same simplistic design that we saw on the Sony KDL-W950C last year. It’s slim, at only about 11mm, but the bezels are thicker. We reviewed the 55-inch model, and it is pretty much uniformly thin around the top part, but thickens near the middle of the back, where the HDMI ports and other connectivity options reside. The dim glow of the Sony logo at the front simply adds to the classic look of this TV. Mounted on the wall, the Sony 55X9300D will look quite nice, and on a table, it looks as good and imposing as a 55-inch TV should. Last year, the Android TV remote wasn’t bundled with the television by Sony, but has been bundled this year, although in a different way. Instead of selling you a separate Android TV remote with touchpad and voice controls, Sony has built it into its own remote. This means that Voice, Google Play and Netflix buttons have been built into the remote. You will, however, have to let go of the touchpad control on the original Android TV remote that was really convenient to use, and the remote is actually a pain to use when you try to use the web browser. 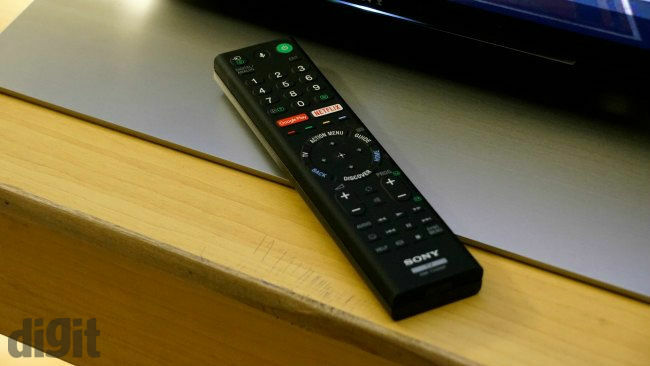 The Sony remote is quaint, which is something that some may not like. It’s a block, and looks like your old geometry boxes with rubberised buttons on it. Unlike the remote we saw on the W950C, the buttons are embossed on to the body. They’re quite tactile, and pretty easy to get used to. The Netflix and Google Play buttons take you to the Netflix and Google Play Movies apps respectively, while there are controls for navigating around the interface as well. You don’t have to point the remote at the TV when using voice, either. The ports on the 55X9300D are pretty much standard for TVs in this range. I wish there was an extra USB 3.0 port, but this is pretty much the industry standard today. 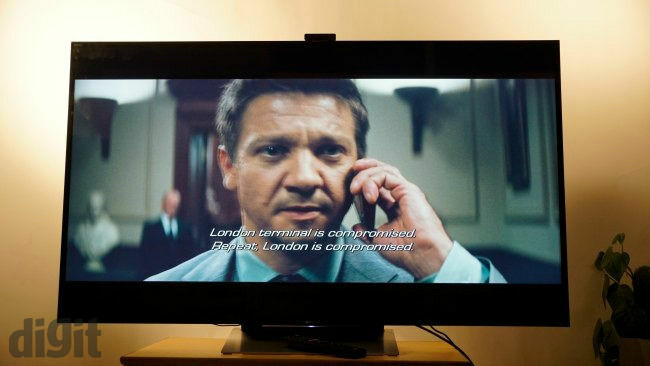 One of the HDMI ports face outward on the side, while three of them face towards the middle of the TV. If you’re wall-mounting the TV, you’d want to use these three ports for consoles or set-top-boxes, which usually always remain connected to the TV. The connectivity options also include WiFi, and an Ethernet port. So, if you want, you can have this TV connected to the Internet using a LAN cable. 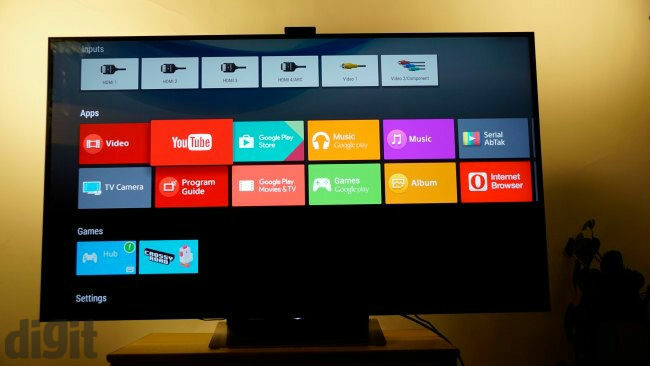 The Android TV interface also has native support for Google Cast. The Sony 55X9300D uses TRILUMINOUS Display technology, of which you may have heard of. The technology is similar to Samsung’s Quantum Dot display, and uses semiconductor nanocrystals in order to produce better colours. The nanocrystals, also called "quantum dots", are light-emitting nanoparticles, which react to blue light to produce pure green and red colours. 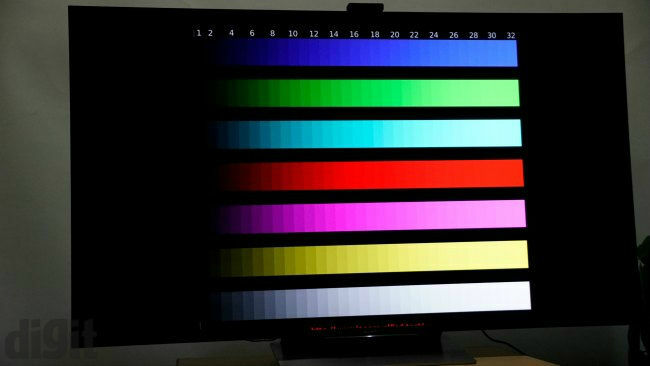 This, in turn, helps Sony achieve a wider colour gamut than regular LCDs. Colours are more pure, owing to lesser mixing between the primary colours that make them. 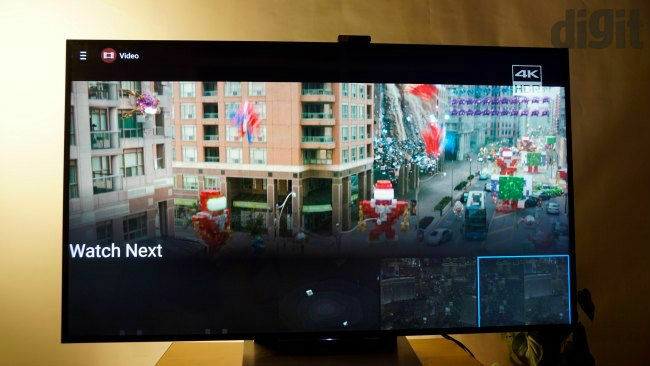 This is also accompanied by the X-Reality engine, which has been present on many Sony TVs. This is an image processing engine responsible for sharpening, noise reduction, better contrast and more. But all this was available earlier as well. What’s new this time is 4K HDR support. This enhances the contrast between the blackest blacks and the whitest whites, enhancing picture quality in a way that humans can actually see and perceive through naked eyes. But HDR or not, the picture quality of this TV is top notch. To be honest, we expected better contrast ratio, but 870:1 (at 50% brightness) is nothing to be ashamed of. We’ve seen way worse, but LG’s OLED panels still produced significantly better results. It does better with NTSC colour gamut (suited to TVs) than older LG UHD 4K TVs, but again, it still is not as good as OLEDs. We’re in the process of reviewing the new Samsung SUHD TV, which also uses Quantum Dots and HDR, and can’t wait to find out how well it does. Testing them side by side, though, the Sony performs better in terms of sharpness and details. In our opinion, the best thing about this TV is the X-Reality engine, which manages so many aspects of the picture, and how. Content looks sharp and colours aren’t oversaturated. Even when you play lower resolution content on this TV, it deals with it quite well. The viewing angles are great, with colour shift noticeable only when you approach very acute angles. The only real issue we had with the 55X9300D was its glossy panel, which made it reflective. This can be an issue in large, brightly lit rooms, and while this TV is quite bright, you'll need to keep the brightness levels higher than you usually would with a matte panel. With HDR content, the 55X9300D makes highlights pop, and the difference between blacks and whites is so good that I saw parts of movies that I had never noticed before. For example, the cut on Batman’s suit just before he jumps off a skyscraper to invade Lao’s offices, in the Dark Knight movie. Availability of HDR content in India is sparse. The Sony TV comes pre-installed with Netflix, which can be used to watch HDR content, but you need to pay Rs. 800 per month, and need at least a 24Mbps Internet connection. In fact, the first time you open the Netflix app, it'll prompt you to upgrade to the top tier pack. 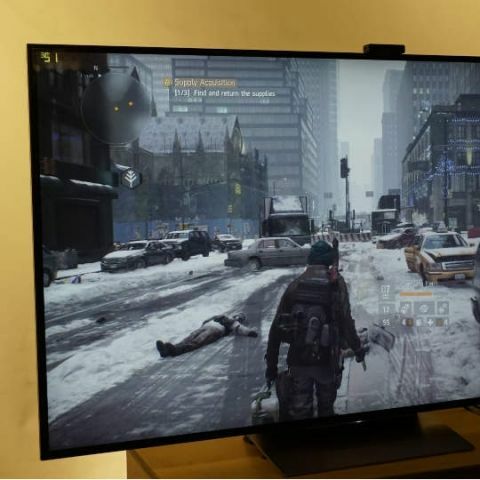 In the US, Sony sells this TV with its own Ultra app, which allows users to buy 4K HDR movies from the Sony Pictures stable, but it isn’t in India right now, and Sony seems to have no plans to bring it to the country at the moment, either. We even tried to find HDR movies on torrents, but there were none. Fortunately, the Sony 55X9300D 4K HDR TV deals with almost all forms of content very well, making it a future-ready television. HDR content is more easily available overseas, and despite not quite being here yet, it should be arriving in near future. The 55X9300D TV also comes pre-installed with the Serial Ab Tak and SonyLiv apps, which can deliver content. Interestingly, the SonyLiv app seems to be quite different from the one you get on your phone. You also get BigFlix, which, honestly, has a very poor collection and mostly in bad quality. You may also download the Eros Now app to stream more movies, and we’d recommend this over BigFlix any day. You will, however, get a free three-month subscription to the BigFlix app with this TV. Lastly, you can also buy and stream movies off Google Play Movies. Android TV’s collection of apps, even in India, seems to have grown this time. We could find most of the games we play on our Android smartphones, like Modern Combat 5, Asphalt 8 and more. It still isn't a particularly huge collection, though. 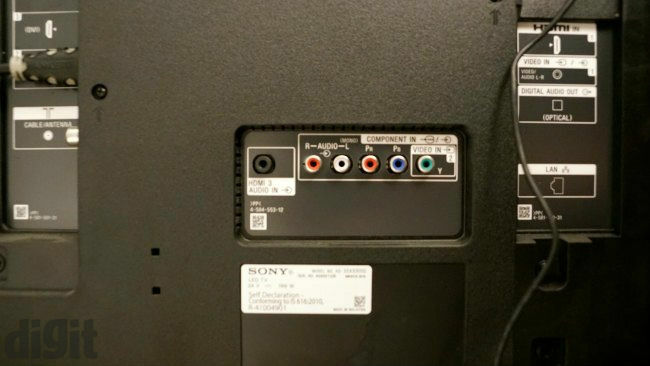 The Sony KD-55X9300D TV has four 7.5W speakers attached to it, and it’s more than amply loud. At full volume, you can easily hear this TV even from 30 feet away. It should be enough for large rooms, and may be a bit too loud for smaller rooms. What’s more heartening, though, is the quality of audio. Even at the highest volume, we didn’t hear any distortion, and audio is quite clear. The balance of audio levels seem nice, which should take care of most nghttime show viewing reveries. The cost of quality starts at Rs. 2,64,900 at the moment, and the Sony KD-55X9300D 4K HDR TV stands firmly among the best in the market. Android is one of the three most usable smart operating systems in the market right now, and its picture quality is among the best, if not the best. If you can afford it, you won’t be disappointed with this television. Which 50 inch UHD HDR TV should I buy within a budget of Rs. 100000?